Banyan trees are fig trees. 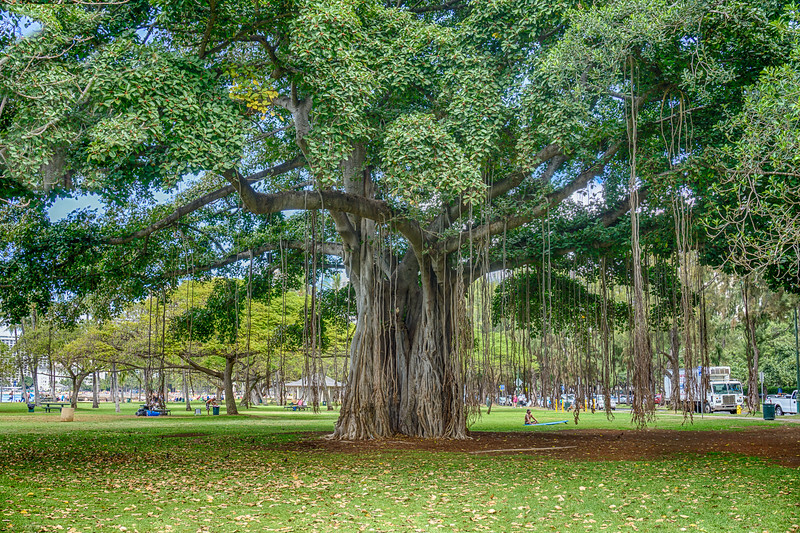 Older banyan trees are characterized by their aerial prop roots that grow into thick woody trunks which, with age, can become indistinguishable from the main trunk. Old trees can spread out laterally, using these prop roots to cover a wide area. In some species the effect is for the props to develop into a sort of forest covering a considerable area, every trunk connected directly or indirectly to the central trunk. In a banyan that envelops a support tree the mesh of roots growing round the support tree eventually applies very considerable pressure and commonly kills the tree. Such an enveloped dead tree eventually rots away so that the banyan becomes a "columnar tree" with a hollow central core. In jungles such hollows are particularly desirable shelters to many animals.